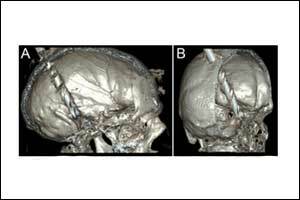 The case of Penetrating head trauma injury with an excellent outcome has been published in BMJ Case Reports. A 55-year-old man was found at his workplace with a metal drill penetrating the midline of the posterior region of the sagittal suture. His Glasgow Coma Scale (GCS) was initially 9, but his condition deteriorated and required endotracheal intubation. CT of the brain showed that the drill had taken an intracranial course, from the transition of the middle to the posterior third of the superior sagittal sinus, crossing the right parietal and temporal lobes, and ending in contact with the tentorial surface of the cerebellum (figures 1 and 2). He underwent emergency surgery to remove the drill. The operation revealed complete destruction of the superior sagittal sinus. 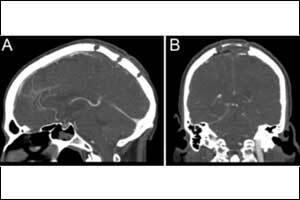 We performed emergent ligation but were unable to reconstruct the superior sagittal sinus because of profuse bleeding. At the follow-up visit 2 months after the surgery, we performed a CT venography, showing absence of flow in the middle and posterior thirds of the superior sagittal sinus (figure 3). His GCS was 15, with no motor neurological deficits and only minimal memory loss—a remarkably favourable outcome. Preoperative brain CT showing the intracranial course of the drill, from the transition of the middle to the posterior third of the superior sagittal sinus, crossing the right parietal and temporal lobes, and ending in contact with the tentorial surface of the cerebellum. (A) Sagittal image. (B) Coronal image. 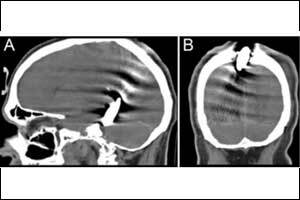 Cerebral CT venography, 2 months after the surgery, showing the craniotomy flap and absence of flow in the middle and posterior thirds of the superior sagittal sinus, with correct flow in the remaining venous sinus and deep venous system. (A) Sagittal image. (B) Coronal image. Laceration of the middle and posterior thirds of the superior sagittal sinus must always be repaired to preserve sinus blood flow. Its ligation or acute blockage is associated with bilateral venous infarcts, as has been clinically and experimentally demonstrated. The anterior third is the only portion in which ligation is associated with questionable safety. In extreme cases, however, as in this report, with total destruction of the sinus causing uncontrollable haemorrhage, ligation of the middle and posterior thirds is not necessarily associated with a poor prognosis. Contributors RR: discussed planning, conduct, acquisition of data; drafted the article; revised the content, and finally approved the version. CA: drafted the article, revised the content and finally approved the version. MJM: drafted the article, revised the content and finally approved the version. RA: discussed planning, drafted the article, revised the content and finally approved the version.